A griddle is a great piece of cooking equipment to have in the kitchen. It is a flat cooking surface with a heat source underneath and can be in one of three formats. It can be a piece of cookware, such as a non-stick or cast iron griddle that is heated over a burner, or it can be built into a range. There are also electric griddles, which are plugged in and rest on the counter, separately from a stovetop. 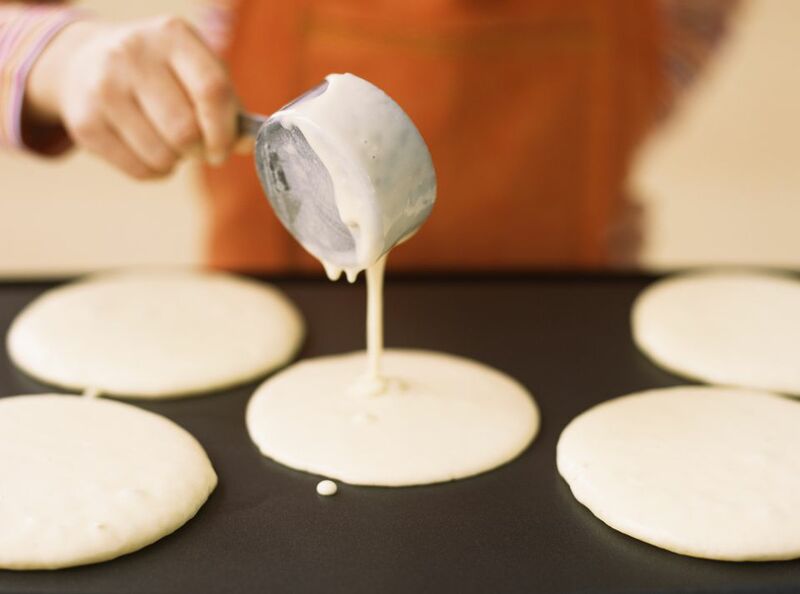 Griddles are ideal when cooking for a crowd as they have a large surface area. The fact that there are no sides (as with a skillet) makes it easier to flip food, and the open area doesn't trap any moisture so the food—for example, hash browns—becomes nice and crispy. When many of us hear griddle we think of breakfast. Probably because most pancake recipes instruct to "heat the griddle" as you make the batter, or as we sit at the counter at the diner we watch the cook crack our eggs onto the griddle. It works well for not only pancakes and eggs but also bacon, French toast, hash browns, and other breakfast items. Griddles are also often used for cooking burgers and other hot sandwiches such as grilled cheese. An electric griddle does have a few advantages over one that is in or on the stovetop. Because it is not relying on the range burners as the heating source, the cooking surface is heated evenly throughout. An electric griddle also has a well around the sides for where the grease can drip off and pool. And if you are cooking a lot of dishes at once—for a holiday, for example—you are not taking up any of the burners on the stove. A commercial griddle (i.e. a griddle that is built into a range top) may look similar to a flat top but they are different in certain respects. For one thing, flat tops tend to be made of lighter steel, and the heat source underneath is made up of multiple round burners, not one that is rectangular and runs across the entire top, as is with a griddle. Also, only food is placed directly on the griddle, whereas a flat top can accommodate both food and cookware (such as pots and pans) on its surface. Whether cooking on a standalone electric griddle or on a built-in griddle on a range, it's important to keep some key safety tips in mind. Always use an oven mitt when working with a griddle; as the griddle gets hot, it can be easy to forget that all elements of the griddle (including the handles and edges) will heat up. You should also use a properly sized spatula. If you are cooking oversized sandwiches, giant pancakes, or other large food items, use a larger spatula to prevent burning yourself (and the food). It is important to keep an eye on excess grease during cooking. If you are cooking bacon, for example, you will have a lot of grease and will need to make sure the grease can be drained and will not overflow onto the stovetop. Grease fires occur when grease interacts with an open flame. The benefit of cooking with a griddle is the big, smooth surface it provides. But having this large surface means that you need to keep a few things in mind. First, make sure that you use a proper amount of oil, butter, or non-stick cooking spray to ensure your food does not stick to your griddle. If you are using a very large griddle, it can be helpful to keep your oil in a plastic squeeze bottle; this way you can precisely point and aim when adding oil to the griddle. If you are using a griddle that sits over your stovetop burners you can create different zones with your griddle, from hot to warm. Utilize the different burner strength to create temperature zones on your griddle, or if using your griddle over a grill, keep the very hot area separate from the warmer zone. This will allow you to cook at more precise temperatures and keep your food warm while other items may still be cooking. Like any other cooking tool, in order to keep it in good working shape and extend its life, you need to clean the griddle after each use. When you are finished cooking, scrape off all the food residue and cooked bits from your griddle. It can be helpful to then wipe the griddle clean with a damp rag. Wear protective gloves, as the griddle will still be hot. Finally, add a thin coat of cooking oil, wipe it down with a rag, and safely store it so it is ready the next time you need it.